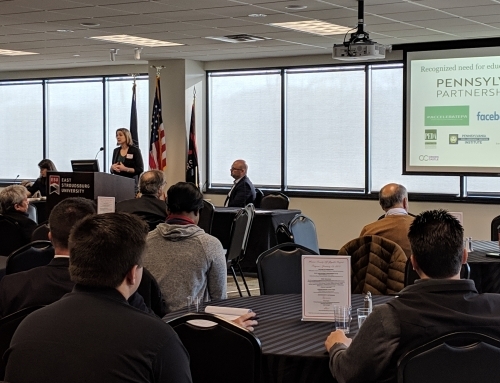 EAST STROUDSBURG — Gigabit-speed cable internet has gone live for parts of Monroe County, the AcceleratePA coalition announced during a Friday meeting at Dansbury Depot. Blue Ridge Communications has debuted a broadband service that boasts download speeds of one billion bits per second. “This is probably one of the biggest rural broadband projects in the country,” said Kelly Lewis, a former State Rep. and current president of technology procurement firm Lewis Strategic. None of those investments are taxpayer-funded. 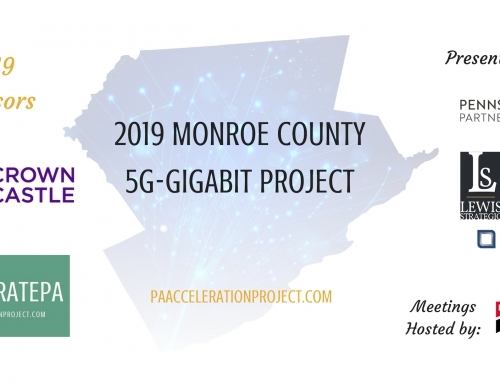 The Monroe Gigabit Project — started last year by AcceleratePA partners Lewis Strategic, Dellicker Strategies and Business Information Group — issued a request for proposals in April seeking private-sector investments in local broadband. Four internet providers responded to the request for proposals. Those companies were NCN Data, GoNetSpeed, PenTeleData and Sprint Communications. Blue Ridge Communications serves as PenTeleData’s regional provider for the Poconos. The company started its gigabit rollout in the West End, with locations in Tunkhannock and Eldred townships online already. The internet provider expects to extend that service to the rest of the county by May, said Scott Hoppel, commercial sales director for PenTeleData. Blue Ridge is currently transitioning its cable television customers from analog to digital connections to free up network space. Optical fiber cables are made from bundles of thin, transparent filaments that transmit information in the form of light. Data can therefore travel at near-lightspeed in ideal conditions. Fiber also transmits data with less loss than copper wire and is immune electromagnetic interference. Blue Ridge Communications operates through a limited partnership with PenTeleData, which is also the nation’s oldest cable company. PenTeleData is among the largest private owners of broadband, with more than 9,000 miles of fiber optic cable between Pennsylvania and New Jersey. Although faster than electrical transmission, optical fiber can incur higher installation costs. Its more recent development makes it less common than traditional copper conductors. Fiber networks must therefore be built out to the serving location. Stroudsburg-based NCN Data was first in the county to go live with gigabit speeds for residential customers. The company currently offers fiber-to-the-home service in its downtown Stroudsburg coverage area. NCN Data currently charges $299 a month for its gigabit-speed fiber broadband. The costs comes to $3,588 annually. GoNetSpeed, a new internet provider headquartered in New York, submitted a conditional proposal to extend its existing fiber network in the northeast. The first of two phases would bring fiber to commercial customers in Monroe County at the company’s own cost. GoNetSpeed is seeking a minimum number of potential buyers to justify the initial investment. The company was still shy of its threshold as of Friday, Lewis said. A second phase GoNetSpeed’s proposal would extend those commercial networks to residential customers in Stroudsburg and East Stroudsburg boroughs. The company needs to secure about 200 more potential buyers, said Lewis. Interested customers can register — without obligation — at GoNetSpeed.com. GoNetSpeed’s proposed pricing comes closest to the “Gigabit City” levels, which provide gigabit speed for $1,000 or less a year, that AcceleratePA aimed to achieve. GoNetSpeed is offering a $1,080 annual charge for the service, billed at a $90 monthly rate. The current minimum for Blue Ridge Communications’ cable gigabit service is $129.95 a month, which comes to $1,559.40 annually. Sprint Communications had not updated its offerings as of Friday, said Lewis, but the company has previously made significant wireless investments in the region. Although current internet pricing has yet to breach the desired levels, those costs could come down as demand and coverage areas grow. Providers will have fewer expansion costs once local networks are established. Those infrastructure improvements should also expedite the awaited rollout of fifth-generation cellular data networks. Wireless providers around the world are racing to deploy 5G services and equipment capable of bigger bandwidths and faster speeds than current 4G standards. AcceleratePA will meet Dec. 4 for another public presentation. The coalition expects to have further updates on provider progress by that time.